Plumbing is a crucial part of your home and it’s important to ensure everything is working correctly and any issues are dealt with quickly. From the bath and shower, to the boiler system, plumbing is essential to the day to day running of your home. Pipes bring fresh water into your home and take away waste from toilets and sinks, which mean they must remain separate to avoid contamination. 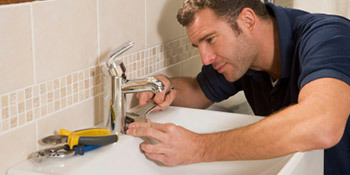 That makes it essential to have a professional plumber take care of any problems. Why would I need a plumber? At one stage or another every homeowner will need professional plumbing services. Every now and then you could find a leaking tap or pipe that needs fixing, or your boiler could breakdown. Boilers are one of the most important appliances in our homes, providing heat and hot water throughout the year. Therefore, it’s essential that they’re well maintained and serviced at least once a year. With the boiler system there are many parts including the pipework, and any problem must be quickly dealt with to avoid inconvenience. It’s not uncommon to find a leak from your pipework or a tap. This can cause water to seep through the walls or floor, creating moisture and mould. If an issue isn’t dealt with quickly it can become extremely costly, sometimes resulting in hundreds of pounds to have walls and ceilings renovated. Plumbers don’t just deal with problems that arise, but also replace and install new pipework to your home’s needs. You may want a radiator or sink relocated, meaning the pipework will have to be extended or shortened and correctly installed. Finding a plumber isn’t easy and you need to hire someone you feel comfortable with and know is a reputable trade professional. If you’re interested in receiving up to four FREE quotes from local, vetted and reputable plumbers, complete our quick form below. Project: need what sounds like a leak to be fixed which is under the floorboards. Very prompt response and initial viewing of the job. Received a quote the same day and the job was booked in for a week later. Barry’s has services were really helpful and even went the extra mile stripping out both fire places, taking them outside for me and removing the excess from the wall. Really pleased. Local Heroes understood the problem, advised us on the best trade to resolve it, professional, fast to respond, reliable and resolved the problem within an hour. We were given an almost immediate response and quote and the work was completed within 24 hours. Professional, understanding our issue and advising us of the most appropriate trade to resolve it. Polite. Fast to respond to our same day emergency, Reliable, the tradesman arrived exactly as quoted, Payment was easy and clear. Satisfaction, the issue was resolved within an hour. Tremendous service! We were given contact details of a local plumber and were contacted within a few hours and the work was completed within 24 hours of contact. The service could not have been better and the job was completed to an extremely high standard. Properties are given an energy rating dependent on exactly how efficient they are and ratings are shown in the information below. This ranges from A, by far the most energy efficient, to G, the least efficient. With a higher rating you're more likely to have less expensive energy bills as more heat will likely be retained in the home. You'll be able to increase your home's efficiency with insulation such as double glazing, loft lagging or wall cavity insulation. There are many types of home in the United Kingdom and the info below highlights the type of homes in Uk. Over the country the most popular property types tend to be semi-detached and terraced housing, but detached homes, flats and bungalows are also available. The pie chart below illustrates the proportion of homes within Uk that are central heated and non-central heated. Central heating figures within the bulk of UK properties, including those on the gas grid and homes heated by oil and electric. The data beneath reveals the spread of homes heated by different fuels. Throughout the United Kingdom the most common undoubtedly are gas heated properties, followed by electricity and then oil. Biomass central heating boilers are also rising in popularity, heated by environment friendly products including wood pellets or agricultural waste.|Properties in Britain are heated up by a range of fuels, which include gas, electricity, oil, solid fuel and LPG boilers. Each fuel has a varying cost associated with it so you may find yourself with less costly energy bills by switching the way your house is heated. Even solar thermal panels are being considered by many as a way to reduce heating bills for the years to come.